Consumer optimism across United States is at good level. It has increased by 0.1% in April 2017, shows Final Consumer Sentiment survey, conducted by the University of Michigan. It was at 97% compared to 96.9% in March. According to the survey “Consumer sentiment continued to travel along the high plateau established following Trump’s election, with only minor deviations from its five month average of 97.4”. The paper shows that consumers have had positive assessments of the current state of the U.S. economy and expect a period of an economic prospects. There is a clear partisan divide, with the Democratic party supporters having predominantly very pessimistic economic outlook, while the Republicans are and a very optimistic. The partisan divide on the Index of Consumer Expectations was 51.0% points in April (61.4 vs. 112.4), down from last month’s 63.1 (59.4 vs. 122.5) due to Republicans who moderated their optimism, more than Democrats who reduced their pessimism. The survey shows that a selective perception of news is something that keep the partisan divide. Favorable economic developments have been mentioned by Republicans in April, while 75% of the Democrat party supporters have read, seen or listened negative news about the economy. Expectations Index among those who define themselves as Independents rose to 91.3 points in April, a 5.5 points higher than March’s one. Both numbers are very high compared to the 73.1, measured in pre-election month of October 2016. Independent voters account for 42% of all consumers. Their level of optimism shows expectations for continued growth in consumer spending in 2017 at about a 2.5% pace. 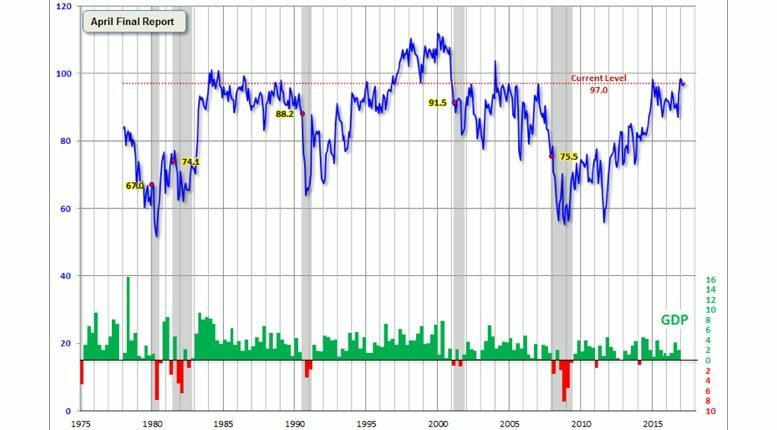 Looking in a larger historical context since its beginning in 1978, the today’s consumer sentiment is 13.3% higher than the average reading (arithmetic mean) and 14.7% above the geometric mean. The current index level is at the 86% percentile of the 472 monthly data points in this series. According to Jill Mislinski, a Research Director at Advisor Perspectives the Michigan average since its inception is 85.6, while the average number for any non-recessionary years is 87.7. The average during the five recessions is 69.3.